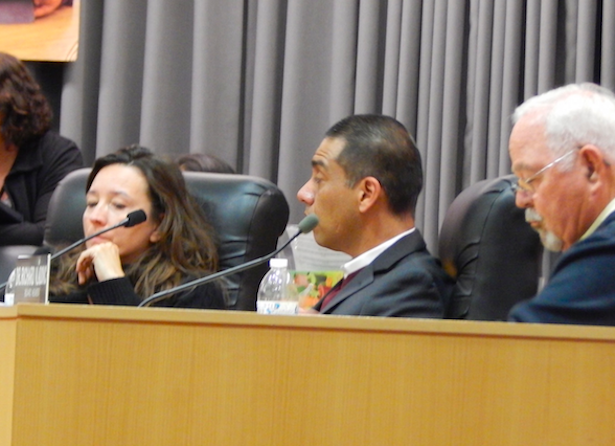 LAUSD school board members, from left, Monica Ratliff, Ref Rodriguez and Richard Vladovic. Members of the LA Unified school board are taking the lead in identifying, encouraging and replicating successful schools with two resolutions that will be discussed at Tuesday’s board meeting. One, sponsored by Monica Garcia and Ref Rodriguez, called Offering Families More – Promoting, Celebrating and Replicating Success Across LAUSD, asks that the district identify best strategies to replicate high-performing schools. The other, sponsored by Monica Ratliff, Richard Vladovic and Rodriguez, titled Supporting Quality Educational Options for Students and Families Through the Development of Magnet Schools, asks for the district to break the backlog of applications for new magnet school programs and start approving more. Both resolutions will ask Superintendent Michelle King to act within a short period of time to figure out how to duplicate the best schools in the district. King stated when she took over in January that identifying and encouraging successful schools was one of her top goals. The district is seeking to boost enrollment and graduation rates as well as stave off a predicted $450 million budget deficit in three years. There are now 210 magnet schools in the district serving 67,000 students, and most of those have higher testing performance levels than traditional and charter schools. Read more on magnet schools: Are they the answer to LAUSD’s enrollment program? LA School Report was told there is some fine-tuning going on with some parts of the resolutions, including financial implications, but both will give the superintendent some direction to explore what it would take to get them done. The magnet schools resolution asks that King’s staff come up with addressing the backlog in a report to the board by June 30. That resolution may look like it could pave the way to make the school board more amenable to plans from Great Public Schools Now and other groups looking to increase the number of high-quality schools in LA. Rodriguez said he contacted Ratliff’s office late Friday to join her resolution involving magnet schools. “It was totally by coincidence, but ultimately both will be great for the district,” he said. The school board meets at the 333 S. Beaudry Ave. headquarters at 1 p.m. Tuesday. It will be broadcast live.